It’s great to add to a sandwich! It’s great to add to a tart base or pizza! Or even to scrambled eggs. Basically it’s up to you and your taste preferences! 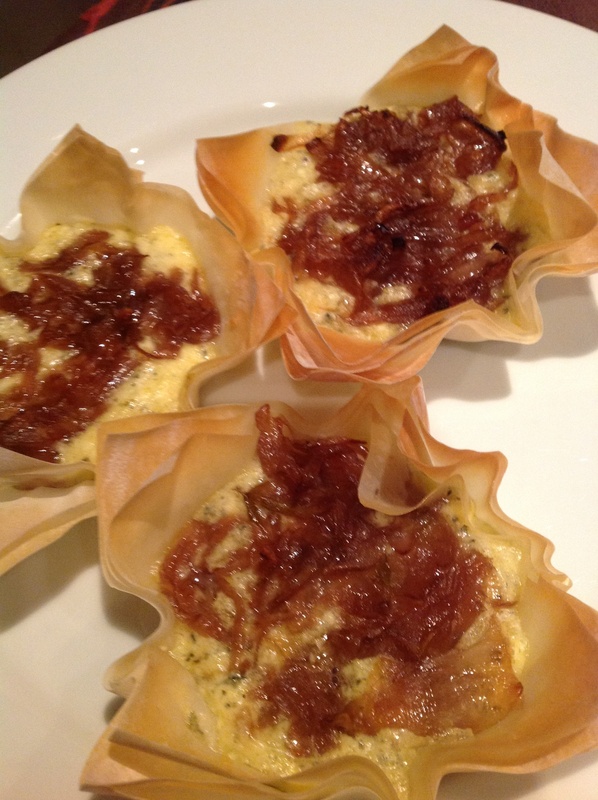 In this photo, I added these onions on my feta and basil phyllo tartlet. Recipe for this will be posted shortly! Be sure when you make the onions, that you are not in a rush! Heat oil in a large frying pan, over low heat. Add the thinly cut onions and a good pinch of salt and cook very slowly for over 20minutes, stirring occasionally to prevent the onions from burning. Don’t speed up the process, by turning up the heat. This is a slow process. When the onions are translucent and softened, and slightly tinged brown, add the sugar and balsamic – this will initiate the caramelization process. Cook for a further 5-10 minutes, stirring occasionally. Once ready, store in the fridge in a sterilized jar or use within 3 days in normal container. This entry was posted in cooking as easy as 1..2...3 and tagged balsamic vinegar, brown sugar, caramelized onion, onions by angelb38. Bookmark the permalink.